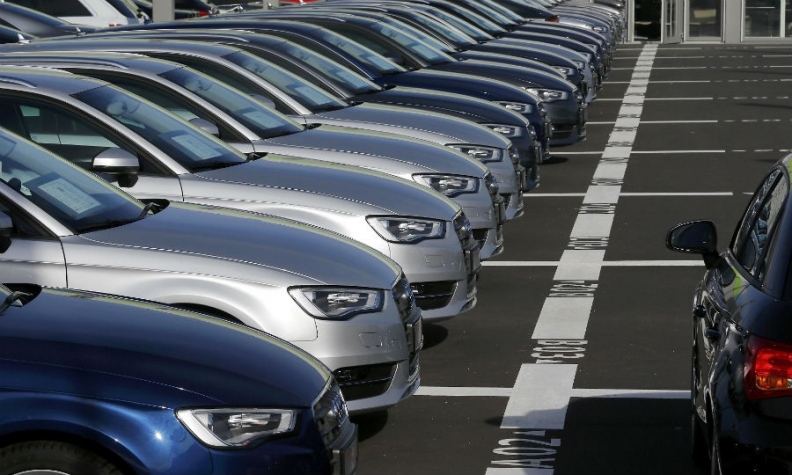 European new-car sales rose 9 percent in April with nearly all automakers recording sales increases and Volkswagen Group's namesake brand back to growth despite its diesel-emissions scandal. Passenger-car registrations in the European Union and EFTA markets increased to 1.3 million vehicles last month, according to industry association ACEA. Four-month sales rose 8.3 percent to 5.25 million vehicles. "The EU passenger car market posted strong results again, marking the 32nd consecutive month of growth," the group said today in a statement. "This is the highest result in volume terms since April 2008, just before the economic crisis hit the automotive industry." European car sales returned to annual growth in 2014 after a six-year slump during which registrations fell to their lowest in decades. Demand has been growing each month since as an improvement in consumer confidence, retail incentives and new product launches lured customers back to the showrooms. April's growth was boosted in part by extra shopping days as the Easter holiday shifted into March this year. Sales at VW Group, Europe's top-selling automaker, increased 5.3 percent last month, slower than the overall market, resulting in its market share dropping to 25.4 percent from 26.2 percent. VW Group's four-month market share was 23.9 percent, the first time the figure for the period was below 24 percent since 2011. VW brand sales rose by 2.6 percent after dipping 1.6 percent the previous month. However its share dropped to 12.1 percent, down 7 percentage points, as the core brand continued to pay the price of the group's diesel emissions test-rigging scandal. Other VW Group brands showed gains - Audi's volume was up 9.7 percent; Porsche 13 percent, Skoda 7.9 percent and Seat 2.2 percent. Sales at PSA Group, the region's No. 2 automaker, gained 5.6 percent, as 6.8 percent growth at Peugeot and 6.3 percent growth at Citroen offset a 13 percent decline at the DS upscale brand which is suffering from an aging product lineup. Renault brand rose by 8.2 percent while Dacia fell by 1.4 percent. Fiat Chrysler Automobiles' volume was up 14 percent, boosted by strong sales of Jeeps, with European registrations of the SUV brand rising 22 percent. Fiat brand sales grew by 14 percent. Among other mass-market brands Opel's volume increased by 6.8 percent while Ford sales were up 4 percent. Asian brands grew faster than the market, with Hyundai sales rising 15 percent, Kia 14 percent and Toyota brand 13 percent. Boosted by the new Civic, Honda saw sales rise by 56 percent. New models helped Mazda sales to grow by 29 percent. Nissan trailed rivals' growth with a 1.2 percent increase. Premium brands had strong gains with Mercedes-Benz brand up 24 percent and BMW brand sales rising 11 percent. Jaguar Land Rover sales increased by 19 percent and Volvo was up 9.1 percent. Download PDF, above right, for April and 4-months sales by automaker, brand and market. All five major national markets recorded sales increases last month, led by Spain, where registrations jumped 21 percent, followed by Italy, where sales were up 12 percent. Germany saw sales rise by 8.4 percent while French sales gained 7.1 percent and UK sales increased by 2 percent. IHS Automotive's manager for the European light-vehicle sales forecast, Carlos DaSilva, said Europe is following a very positive and robust track with the market benefiting from a very strong and deep momentum "that is not abating at all." Pent-up demand remains a significant player in boosting the market, with both the private and fleet markets contributing to growth, he said. "Private demand has been a particular catalyst in the southern European countries such as Spain and Italy but is showing signs of rising in Germany and France too," DaSilva said in an emailed statement. IHS warned that "considerable" macro risks remain for the European market, including a fragile global economy, security and immigration issues, and the UK's upcoming EU referendum.